discrimination in any aspect of employment. This includes hiring, firing, pay, job assignments, promotions and layoffs. 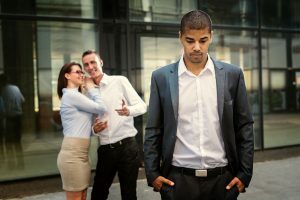 Racial discrimination is also prohibited against someone who is treated unfavorably because he/she is married to (or associated with) a person of a certain race or color. It is against the law to harass someone because of their race or color if the harassment is so frequent or severe that it creates a hostile work environment or results in an adverse employment decision such as demotion or termination. It is against the law for an employer to retaliate against an employee for opposing race discrimination and/or making a claim of race discrimination, including filing complaints with Human Resources, filing Charges with an agency like the EEOC, files a lawsuit or even participates in an investigation or proceeding. Even if the employee who speaks out is not of the same race, he/she is protected from retaliation for opposing discrimination in the workplace. If you feel that you’re the victim of race discrimination or you were retaliated against for opposing race discrimination, contact a Fort Worth race discrimination lawyer today. At Hutchison & Stoy, PLLC we have helped countless people obtain justice in the form of compensation for the discriminatory and retaliatory acts of their racist employers. Contact us at (817) 820-0100 today or provide us with your information online by following this link. The Warriors for Justice have tried quite a few race discrimination cases to verdict and we’ve seen the relief a victim feels when they have been vindicated by a jury of their peers. Call us today and lets get you some justice.